superdumb supervillain: Watch the Birdie! My love for Chronicle Books started with their amazing typography and graphic design titles, branched off into their fantastic cookbooks and now is firmly ensconced in their art and childrens' book collections. 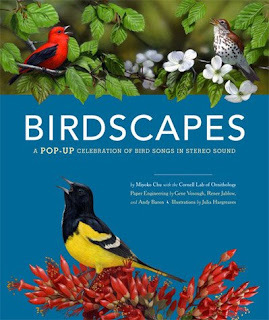 If you need to WOW someone this holiday season, I highly recommend their beautiful Birdscapes pop-up book. It's an investment as books go ($60) but it is truly a treasure. 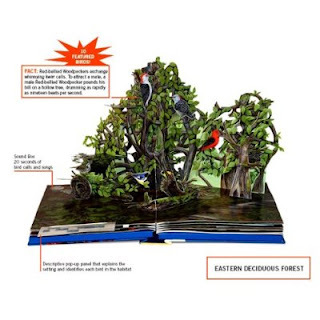 It features seven elaborate landscape dioramas of diverse North American habitats, from the Alaskan Tundra to a Southeast swamp, each with accompanying true-to-life extended recordings of the birds' calls and songs in stereo from the collection of the world-renowned Macaulay Library at the Cornell Lab of Ornithology. Birdscapes also features scientifically accurate illustrations of the birds and moving text about their fragile ecosystems. Perfect for the casual backyard bird watcher or the budding ornithologist. Birdscapes is fragile but Roo loves poring through it and seems to respect its specialness. At just under 5, she is careful with the pages and will spend loads of time just looking at everything in the scenes. I would definitely keep it away from 17 month old Jasper, though! He loves the bird sounds (which may be turned off) but he's too rough for this book just yet. Roo already identified several of the calls we are familiar with from our Kansas backyard, which really impressed me. Oh my, the book is gorgeous! Wow I love it! My mom is a bird fanatic so I try to turn my kids on to bird stuff, so they can have something in common. Also Jojo likes to eat peanuts out of the bird feeder (ew).